On Sept. 26, Stanford students held an event to commemorate the disappearance of 43 students from the Ayotzinapa Rural Teachers’ College in Ayotzinapa, Mexico. Over 100 students from the college commandeered buses on Sept. 26, 2014 for a trip to Mexico City to commemorate the 1968 Tlatelolco Massacre. While in Iguala in the middle of their journey, buses were attacked by local police. Six people were killed, over 40 people were injured and 43 students were kidnapped and presumably murdered. The police allegedly mistook the students as members of a drug gang, but the exact reason of the abduction is still unclear and highly contested. The remains of only one student have been found. 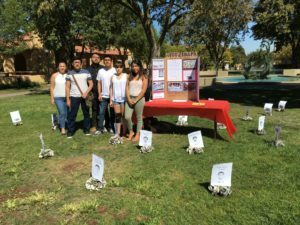 The Ayotzinapa remembrance event was organized through a collaboration among Stanford students and organizations including the Center for Latin American Studies (CLAS), MEChA de Stanford, El Centro Chicano y Latino and other activist groups. Andrea Hale ’15, a current coterm in CLAS, was involved in leading the collaboration and organization efforts. As a student who majored in anthropology and Iberian and Latin American Cultures as an undergraduate, Hale had already been dedicated to studying social justice issues in Latin America and, more specifically, Mexico. Finding out that her peers and others involved with CLAS were interested in planning a remembrance event, Hale spearheaded its organization in what she described as an organic and inter-organizational process. The commemorative spirit of the event featured 43 flowers made of newspaper with the portraits, names and ages of each of the students who disappeared. In addition to being commemorative, the event allowed students who were unknowledgeable of the Ayotzinapa kidnapping to become informed. Above all, this event was planned as a call to awareness and action. Senior Fellow at the Freeman Spogli Institute for International Studies Alberto Díaz-Cayeros lent faculty support to the remembrance organizers, but emphasized that the event was completely planned and run by students. Díaz-Cayeros noted that the 2014 kidnapping has had an impact on Stanford students and faculty in a number of ways. “We have had various activities at Stanford over the past two years since the students went missing, including a candlelight vigil in Bolivar House two years ago, when the father and uncle of one of the missing students – who lives in San Jose; the uncle is a service worker at Stanford – was with us. So this touches closer to our own community than what we think,” Díaz-Cayeros said. Díaz-Cayeros noted that other Stanford faculty will continue to follow up on the kidnapping with two more events in the coming weeks. Contact Susannah Meyer at smeyer7@stanford.edu.